Extremadura, in southwestern Spain, is the region with the largest expanse of open range in Europe, the habitat where Iberian pigs are at their best. Its holm oaks, cork oaks and pastures provide a diet for many of the Iberian pigs that are slaughtered and cured in other parts of the country, such as Salamanca or Huelva, where this type of woodland is less common. Extremadura has an extensive and diverse historical and artistic heritage, from prehistoric archaeological sites to the impressive presence of Roman culture and vestiges of Visigoths, Arabs and Jews. Mérida, founded in 25 A.D. and included on the World Heritage list in 1993, preserves significant Roman remains. Other cities like Cáceres, placed on the World Heritage list in 1986, and Trujillo, are noteworthy for their monuments and architecture, due in part to the riches invested by the conquerors of America starting in the 15th century. 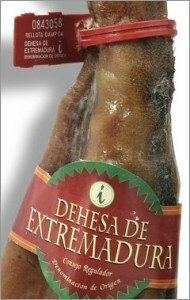 The Dehesa de Extremadura Designation of Origin is a protected DO applied to Iberian jamones and is controlled by a Regulatory Board created in Mérida in 1990. It covers the entire region of Extremadura, although most of the rangelands are in Badajoz province. Iberian jamon products are processed throughout Extremadura, making this region the country's leading producer. Nearly a million hectares of open range are used by some 1500 livestock breeders. The main processing areas are in the mountain ranges of southwest Badajoz (1), Ibor and Villuercas (2), the southern Gredos mountain range (3), the Montánchez range (4) and the San Pedro range (5). This is where most of the hundred-odd processing plants registered under the PDO are located. The main difference between the Dehesa de Extremadura PDO and others is that it can only get its supply of animals from the Extremadura rangelands, whereas other PDOs can acquire animals from any part of Spain. Official Extremadura Jamon PDO labels. The livestock authorised for processing jamones and paletas (shoulder hams) under this PDO must be purebred Iberian or a cross including at least 75% Iberian bloodstock and 25% Duroc-Jersey. Since 2014, the term "Pata Negra" (black hoof) may only appear on labels if the jamon in question comes from a pure-bred Iberian pig, and not from one that has been cross bred. The seal on such jamones is black (a red one is used for jamones that come from acorn-fed, crossbreed pigs, and a green one is used for jamones ibéricos de cebo, i.e. jamones that come from Iberian pigs fed on cereals). Control of the Iberian pigs' breed and weight at the start and end of the montanera, or range-fattening period. Only animals with an entry weight between 80 and 105 kg are suitable, which is a guarantee that they will add a large proportion of their entry weight with a diet of acorns and pasture. Marking and identification of pigs with an ear tag at the start of the fattening period. Yearly quality control of the montanera and the number of pigs per farm. The Board determines the maximum number of pigs that can be fattened per hectare in a season, based on acorn production for the year, in order to guarantee enough food for fattening the animals. Marking and identification of jamones and paletas (shoulder hams) on the carcass in the slaughterhouse after butchering. The pigs come into the slaughterhouse at least 24 hours before slaughter to eliminate transport fatigue and restore muscle glycogen levels. Before processing, the jamones and paletas are kept at a temperature between 1º and 4º C for 36-48 hours. All jamones weighing less than 6 kg and paletas less than 4 kg are rejected. Testing for fat on the carcass by obtaining a fatty acid profile. Controlling the salt concentration in the plant during the salting process. Controlling the minimum time the cuts are kept in the drying shed during the curing process. Controlling the minimum time the cuts are kept in the ageing cellar during the curing process. Between drying shed and cellar, the curing time should never be less than 20 months for jamones and 12 months for paletas (jamon shoulders). Study and control of salt concentration in cuts before they are sent to market (5% maximum sodium chloride). Extremadura jamon is one of the least salty on the market. Bellota (acorn-fed): The animal starts the montanera weighing between 80 and 105 kg and increases its weight by 60% feeding on acorns and grass. Cebo de Campo: The animal eats compound feed authorised by the Regulatory Board and pasture on the open range. In addition to product control, the Regulatory Board is responsible for inspecting the facilities and processes of all farms and plants involved in jamon production. Labels may also refer to the animal's genetic traits, distinguishing between purebred Iberian pigs (100% Iberian stock) and cross-bred pigs (with at least 75% Iberian bloodstock). Crosses with the Duroc breed give slightly less fatty jamones with a higher proportion of lean meat, although it takes a very experienced palette to note organoleptic differences. Outer aspect: A slender hind leg with a long, thin shank and black hoof. 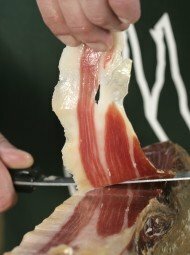 The outer side shows the typical V shape known as the Serrano cut, and is covered with a thick layer of glossy fat. The inner side shows traces of white or bluish-grey fungal growth, an unmistakable feature of slow ageing in the cellar. Weight: Not less than 4.5 kg for jamones or 3.5 kg for paletas. Colouring: Bright. Between rosy and purplish-red. Consistency: Smooth and tender. Glossy white streaks of marbling fat throughout the lean meat. Flavour: Very slightly salty. Full-bodied, intense aroma, highly nuanced. Subtle, delicate flavour. The deep red colour that appears on cutting is typical of free-range animals of advanced age (18 months). The marbling fat causes the glossy white streaks that characterise Iberian pork products and makes them juicy and tender. 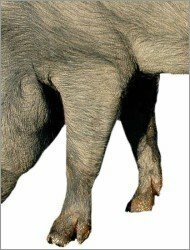 The lustre is due to the low melting point of the marbling fat typical of acorn-fed pigs, and the intense, persistent aroma and flavour come from long ageing. Dehesa de Extremadura jamon is also known for its low salt content, resulting from optimum climate conditions that make the salting period shorter than in other parts of Spain. » By its unbreakable plastic seal with Denominación de Origen Dehesa de Extremadura on it. Jamones are numbered, bear a code indicating the year of slaughter and are colour-coded according to grade: black (bellota 100% Iberian bloodstock), red (bellota 75% Iberian bloodstock) and green (cebo de campo). » By its numbered label, attached to the shank with the Designation of Origin stamp in the same colour code as the seal. » By its weight, not less than 5 kg for jamones or 3.5 kg for paletas. » By its curing period lasting more than 20 months for jamones and 12 for paletas. » By its v-shaped cut. » By its slender shank and characteristic rounded, non-angular shape. » By its fat glossy, fluid and soft to the touch.